Mix all ingredients for dressing. Chop all the goodies and add the dressing. I became a brussels sprouts lover just recently. It all started when I tried them roasted....oh yum. I think they taste the best roasted. But at the beginning of the year the hubby and I were doing a fast and could only eat veggies and fruits. So, I opened the fridge and wonder what I could do with those green little things. Well, to pinterest I went and found that I could make a slaw. I ended up combining three different recipes and both the hubs and I LOVED it! Shred your brussels sprouts (I usually slice mine thin but this this last time I used the Ninja to shred them and boy, it brought down the chopping time to a minute). So whichever is good. Discard of apple core and chop apples. Cut green onions. I also chop my cranberries so they are not too big but you can skip this step if you prefer them bigger. Just add as you go and to your taste and liking. Combine brussels sprouts, apples, cranberries, green onions and sunflower seeds in a bowl and set aside. In a small bowl combine all the ingredients for the dressing. I usually double the recipe b/c sometimes it feels as if it needs a little more. Add dressing to slaw and mix. This salad is even good the day after so make sure to save some for tomorrow's lunch! Okay. This is a soup that I have made for just the two of us and when we have a group of people over for dinner. Every time I make it for guests they seem to really like it. I've made it with and without chicken, made it with orzo, made it with vegetable stock rather than chicken (see variations on the bottom). Every single time it comes out tasting Oh sooo goood! And yes, this is another easy and quick recipe to make. Hope you like it as much as we do! Heat oil over medium heat. Add chopped onion and red pepper and cook until soften, about 3 minutes. Add garlic and cook for another minute. Add beans and chili seasoning. Stir until combined and add chicken stock (whole box). 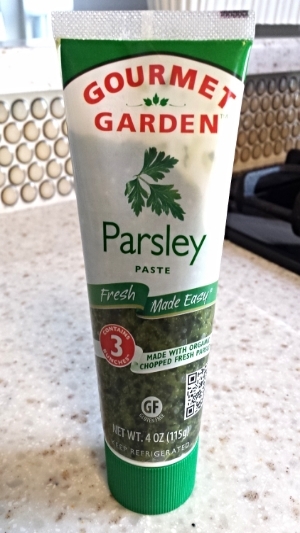 Add parsley paste and stir. Bring to a boil, cover, reduce heat and simmer for 10 minutes. Add more water if needed and cook for another 5 minutes. Add spinach and cook for another 2 minutes. Add cheese, stir and serve. If using chicken: Buy rotisserie chicken and use chicken breasts only, cut into cubes. Add it after adding beans and follow rest of the recipe. If using orzo: Add 1/4 cup orzo after simmering for 10 minutes. Stir and follow rest of the recipe. Have you tried couscous yet? I have to say, I love the simplicity, versitility and yumminess of it. It is sooooooo easy to make. And if you buy it in a box it will save you even more time. Combine tomatoes, garlic, olive oil, parsley paste, red pepper flakes and salt & pepper and set aside. Cook couscous according to the instructions in the box. While waiting for couscous, make sure to peel your shrimp. I buy mine already steamed at the store which makes it so much easier. However, feel free to steam your own if you'd like. Once couscous is done, put a portion of it on the plate, place couscous on top of couscous and then divide tomato mixture on top of shrimp. Enjoy! This is one of my favorite meals to make because it's quick and yummy and there's barely any dishes to clean afterwards! That's a win in my book! The recipe I use is from CooksIllustrated. Adjust over rack to lower-middle position and heat over to 450 degrees. Toss zucchini with 1/2 tsp salt in large bowl; transfer to colander set over bowl. Let stand until zucchini releases 1 to 2 tbs liquid. Dry zucchini with paper towels. Combine tomatoes, oil, garlic, oregano (or parsley), red pepper flakes, salt and pepper to taste. Cut eight 12-inch sheets of foil; arrange four flat on counter and mound zucchini in center of foil, drizzle with wine. Pat fish dry with paper towel and season with salt and pepper. Place fish on top of veggies and spoon quarter of tomato mixture over fillet. 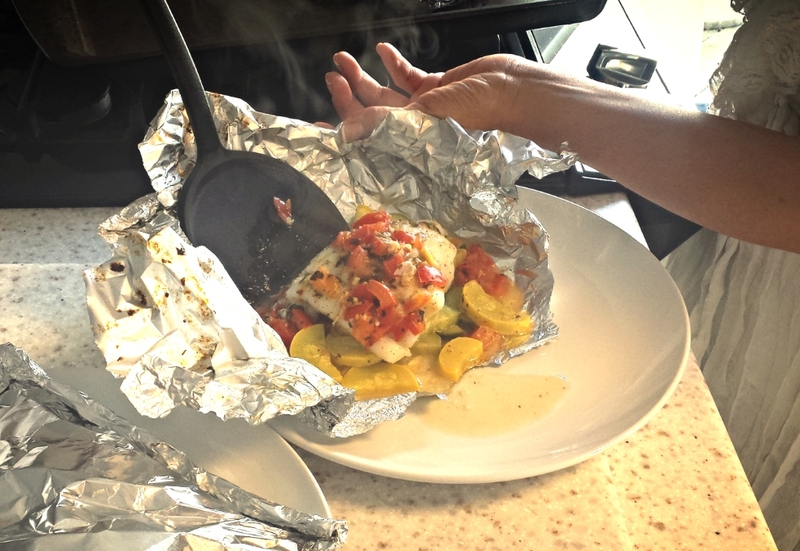 Place second square foil on top of fish; crimp edges together in 1/2-inch fold, then fold over three more times to create a packet. Bake packets 15 minutes. Carefully open foil, allowing steam to escape away from you. Using things spatula, gently slide fish and veggies onto plate with any accumulated juices.